It was announced yesterday by the city council that petrol and diesel cars will be banned from 2020 in areas of Oxford city centre, beating London to be the first city in the world with a Zero Emission Zone. If the proposal is passed, specific parts of Oxford will only be available to motorists who drive zero-emission electric cars. The proposal is a joint venture between Oxford City Council and Oxfordshire County Council and if the plans are given the go ahead, petrol & diesel cars and other types of polluting vehicles will be banned from the city centre in stages. Zero Emission Zone proposals announced for Oxford city centre – Photo of George Street © Copyright Peter Trimming and licensed for reuse under this Creative Commons Licence. Firstly, certain types of vehicles will be banned from a small number of streets beginning 2020, followed by a total ban of all non-electric vehicles throughout the whole of the city centre by 2035 – this will be five years earlier than the Government’s announcement this year which saw the ban of all new petrol and diesel cars from 2040 in the UK. According to the council, Oxford city centre contains illegally high levels of toxic nitrogen dioxide which can contribute to certain illnesses such as asthma, cancer, heart disease and strokes – as a result there’s 40,000 deaths occurring every year in the UK. 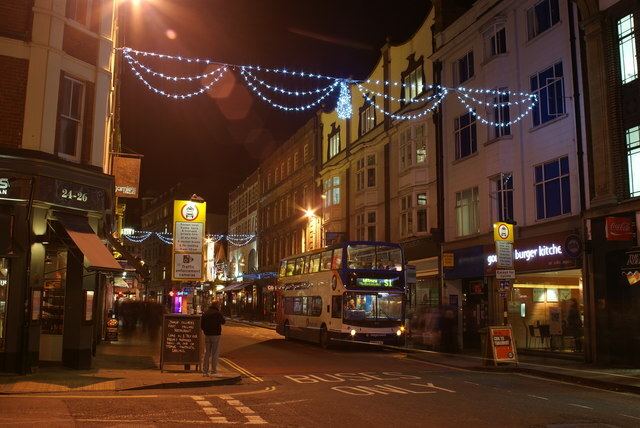 By introducing the zero emission zone in the city centre of Oxford onto the most polluted street, George Street, the nitrogen dioxide level would be reduced by 74% by 2035, lowering to well below the legal limit. He believes local residents who’ve invested in hybrid vehicles will be targeted as a result of the proposed plans to ban all non-zero emission vehicles, saying it’s unfair and an unwelcome disincentive as the use of these type of vehicles should be supported. An Ultra Low Emission Zone is set to be introduced in the centre of the capital from April 2019, which will see a ban on the most polluting vehicles.